(Feb. 2, 2018) As I spent a week learning about transportation planning, I wasn't sure how many people would be interested in learning about a new bike lane downtown. I come from Los Angeles, a city well-known for its numerous highways and traffic, but not its bike-friendly roads. A career shadow program organized by Reed College and the Portland Bureau of Transportation showed me just how passionate Portlanders are about having clean, green transportation options. 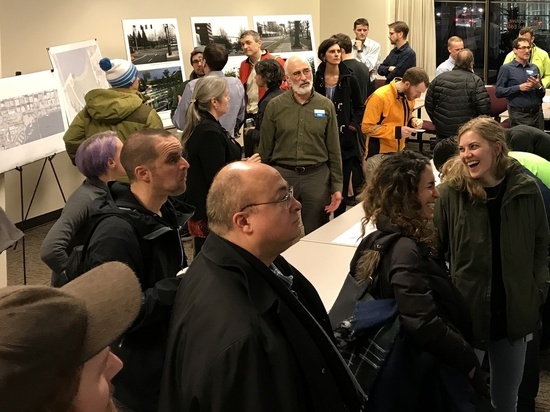 On the evening of Jan. 10, Portland residents gathered at PSU’s Center for Executive and Professional Education, to see PBOT’s first unveiling of the plan to renovate SW Naito Parkway. The event was held at night, deep inside a large building. Despite the voluntary nature of the event, a surprisingly large amount of people came! More than 130 signed in, in writing, at the entrance. Recent college graduates, retirees, people who live downtown, and Southeast and Northwest Portland – all crowded into the Open House. 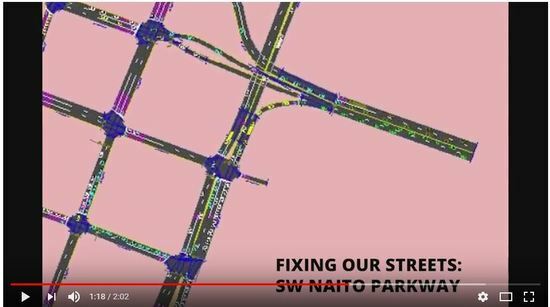 SW Naito Parkway is a scenic corridor needing improvement. Gov. Tom McCall Waterfront Park and the Willamette River provide a spectacular view. However, currently, there are problems of safety, traffic congestion, and cracking pavement. During peak hours, vehicle traffic builds up all the way from Hawthorne Bridge Ramp to sometimes as far as Harrison Street. However, traffic is not the only concern. People utilizing other modes of transportation are also placed in dangerous situations. For example, the lack of bicycle facilities requires people riding to weave through pedestrians in Waterfront Park and to navigate a steep, narrow sidewalk to access the Hawthorne Bridge. The official plan consists of creating new, safer facilities for both bikes and pedestrians. It would build a 12-foot two-way bikeway and a 8-foot wide sidewalk, both separated from car traffic by a curb lined with trees. It also attempts to improve traffic efficiency through the use of new traffic signals. A new traffic signal on the bridge ramp would ease traffic through, removing a blockade that often stops rush-hour traffic on SW Naito. This would cut time spent stuck in traffic. The project is planned to begin construction at the end of 2018, and will take about nine months to complete. Once I walked through the door, it felt as though I was in a modern art museum. To my left was a video simulation of cars, represented as small dots, flowing on SW Naito and onto the bridge. To my right was a 3D video of a virtual flyover, in the futuristic perspective what looked like a low-flying drone. Photo by Christopher Sun, Portland Bureau of Transportation. The Open House event revealed these plans to the public to increase awareness, to gain an idea of public opinion, and to receive input on possible improvements. Once I walked through the door, it felt as though I was in a modern art museum. To my left was a video simulation of cars, represented as small dots, flowing on SW Naito and onto the bridge. To my right was a 3D video of a virtual flyover, in the futuristic perspective what looked like a low-flying drone. Further back and to my left, were posters with white borders and an artistic quality in each. In the middle was an expanded, 20-foot long aerial photo of the street with the planned improvements marked all over it. People were encouraged to write down their specific concerns and praises on sticky notes, placing them in the right spot on the map. The general view of the public seemed to be positive. As expected, people who ride bicycles were extremely enthusiastic, leaving multiple suggestions and staying longer at the Open House to talk to fellow bikers and to learn more of the project. However, it appeared that pedestrians and drivers were also generally supportive of the project. One concern of a driver was losing a lane under the bridge in an already crowded route, but, they also felt that the improvements in efficiency would eliminate this problem. Pedestrians were also supportive of the project, but they were still somewhat unclear as to exactly how much safety would be improved. The plan is still in its 60 percent stage, but the big, yet diverse turnout to the Open House reaffirms the communal spirit of Portland. Furthermore, the general, positive view of inclusive transportation accommodations reaffirms Portland's support for cleaner forms of transportation. Hopefully, the project will be completed as soon as possible, and improve traffic and allow thousands of people to bike and walk along a new, safer route. VIDEO: Click on the image to see the traffic model, showing how long it takes cars to enter the Hawthorne Bridge with a stop sign, versus how more frequently cars get through with a planned traffic signal. This was shown at the open house and is available on PBOT's YouTube channel. 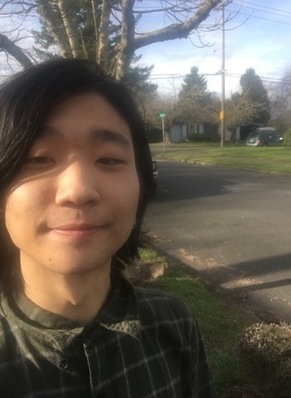 Ryan Kim is a sophomore studying economics at Reed College in Southeast Portland. He recently spent a week at PBOT, learning about communication and transportation planning. Naito Parkway was named after Bill Naito, a pioneer of downtown revitalization who graduated from Reed with a degree in economics in 1949 and later served on the Board of Trustees.